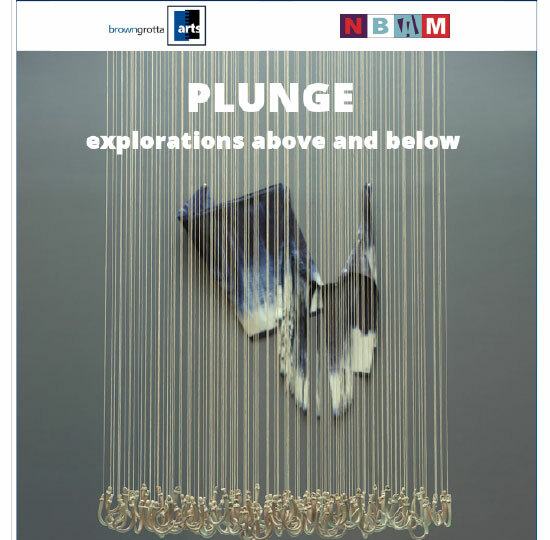 Plunge: Explorations from above and below. 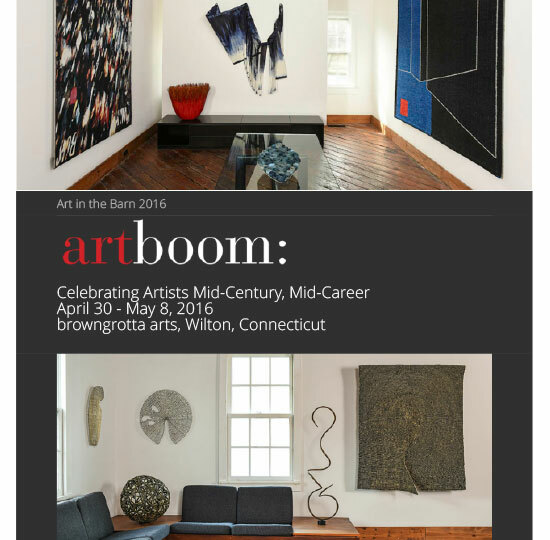 , at the New Bedford Art Museum/ArtWorks! 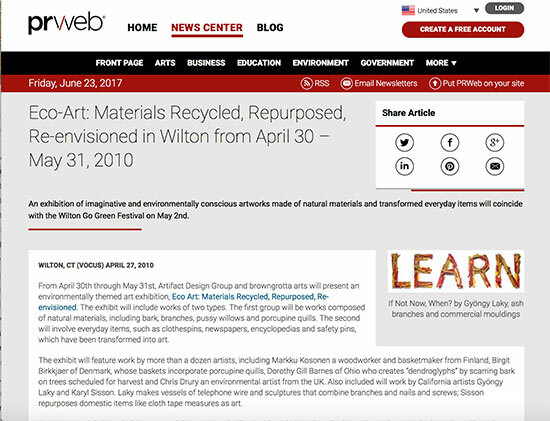 in New Bedford, Massachusetts explores water as an artistic influence through October 8, 2017. 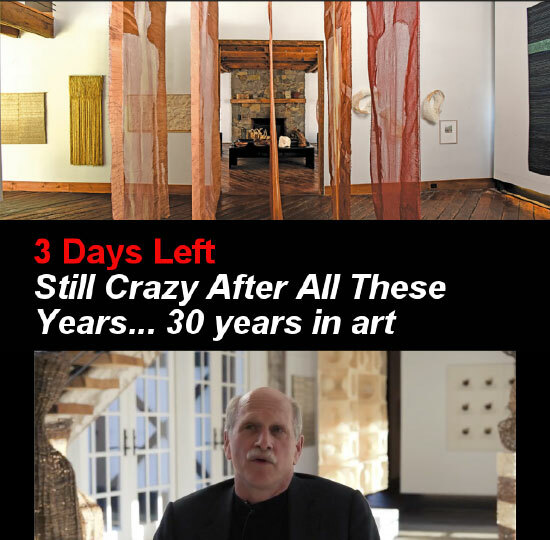 Our 30th Anniversary, once-a-year, 10-days-only Art in the Barn exhibition, Still Crazy After All These Years...30 years in art is open for just three more days. 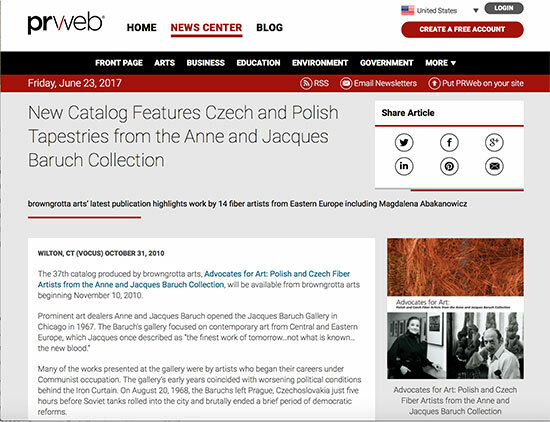 Eighty-three artists have provided extraordinary work to honor our milestone. 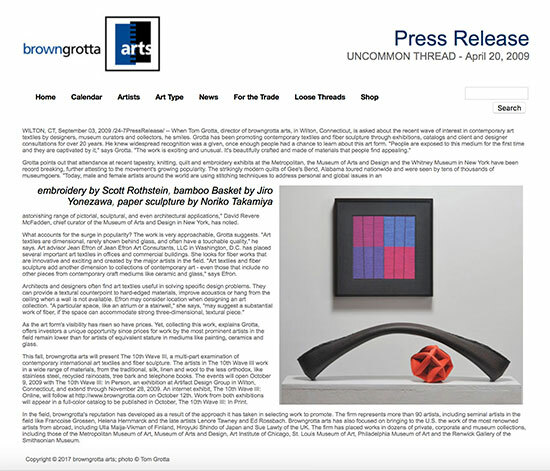 There is a catalog for the exhibition, with an essay by Janet Koplos, available at browngrotta.com after May 1st. 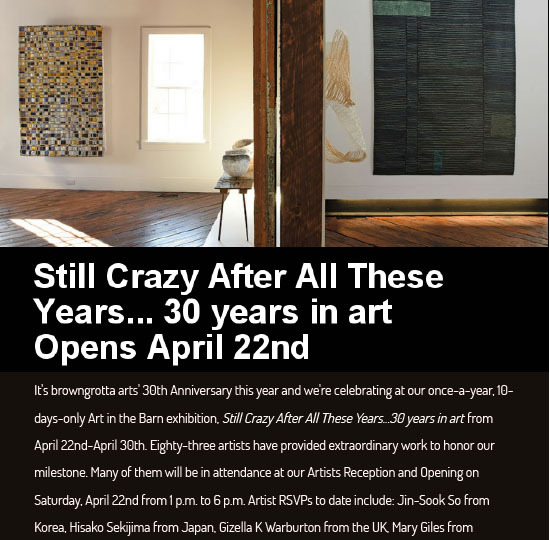 It's browngrotta arts' 30th Anniversary this year and we're celebrating at our once-a-year, 10- days-only Art in the Barn exhibition, Still Crazy After All These Years...30 years in art from April 22nd-April 30th. 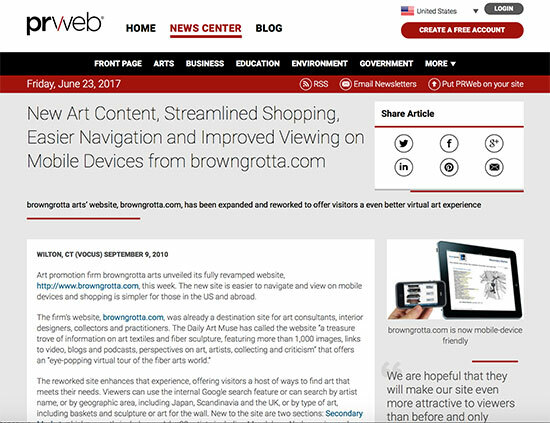 Eighty-three artists have provided extraordinary work to honor our milestone. 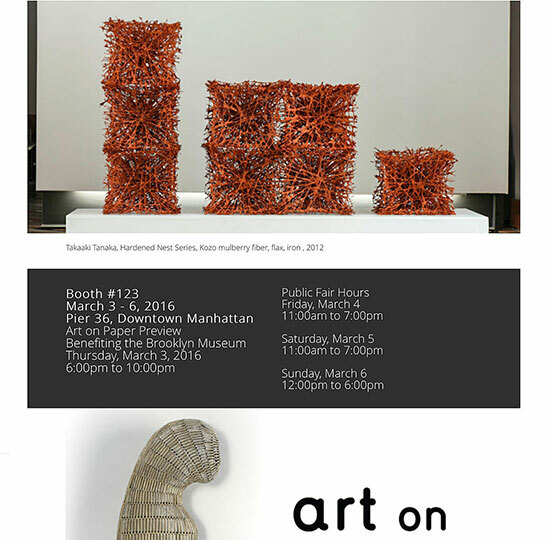 Many of them will be in attendance at our Artists Reception and Opening on Saturday, April 22nd from 1 p.m. to 6 p.m. 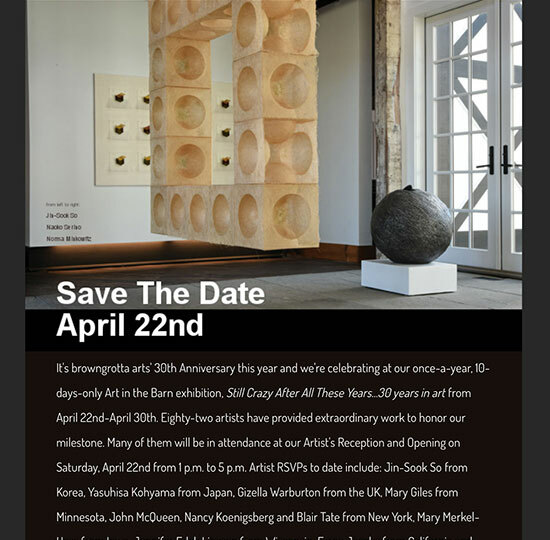 It's browngrotta arts' 30th Anniversary this year and we're celebrating at our once-a-year, 10-days-only Art in the Barn exhibition, Still Crazy After All These Years...30 years in art from April 22nd-April 30th. 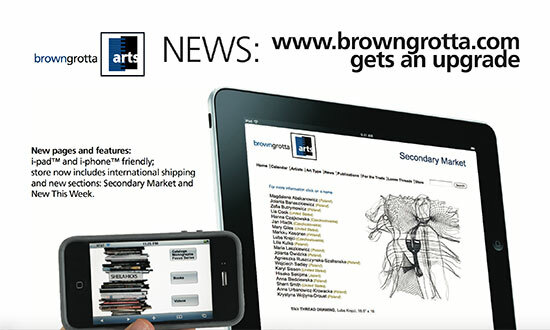 Eighty-two artists have provided extraordinary work to honor our milestone. Many of them will be in attendance at our Artist's Reception and Opening on Saturday, April 22nd from 1 p.m. to 5 p.m.
Arts Alive! 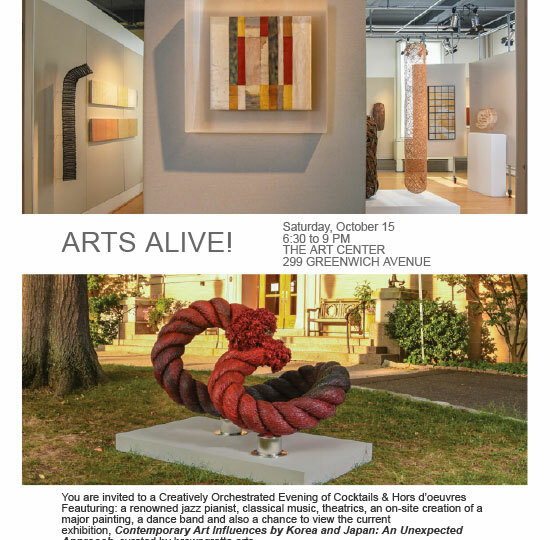 Saturday, October 15 6:30 to 9PM The Art Center 299 Greenwich Avenue, You are invited to a Creatively Orchestrated Evening of Cocktails & Hors d’oeuvres Feauturing: a renowned jazz pianist, classical music, theatrics, an on-site creation of a major painting, a dance band and also a chance to view the current exhibition, Contemporary Art Influences by Korea and Japan: An Unexpected Approach, curated by browngrotta arts. 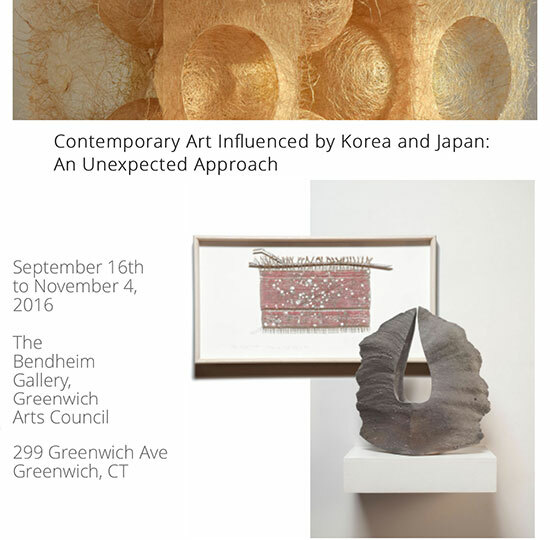 Contemporary Art Influenced by Korea and Japan: An Unexpected Approach, From September 16th to November 4, 2016, the Greenwich Arts Council will present Contemporary Art Influenced by Korea and Japan: An Unexpected Approach, curated by browngrotta arts. 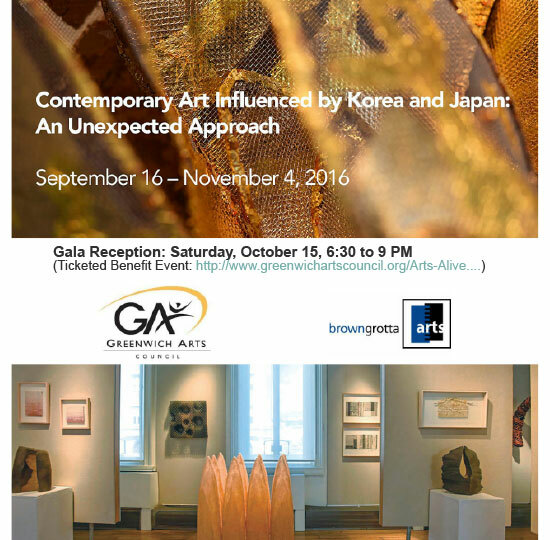 The exhibition includes 60+ select works of ceramics, textiles, baskets and sculptures by artists from Japan, Korea and the United States that each reflect an Asian sensibility. 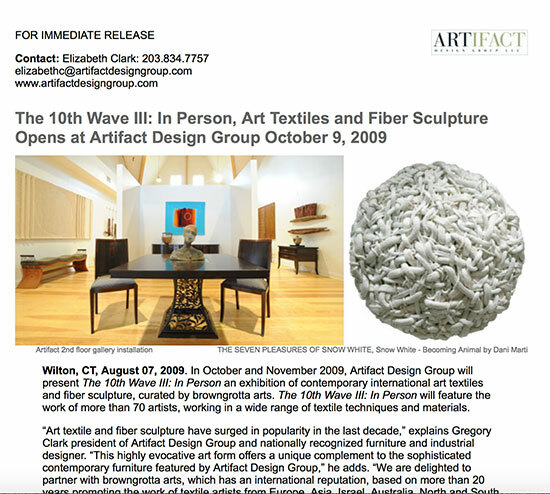 Contemporary Art Influenced by Korea and Japan: An Unexpected Approach, Contemporary Art Influenced by Korea and Japan: An Unexpected Approach, curated by browngrotta arts, includes 60 select works of ceramics, textiles, baskets and sculptures by artists from Japan, Korea and the United States that each reflect an Asian sensibility. 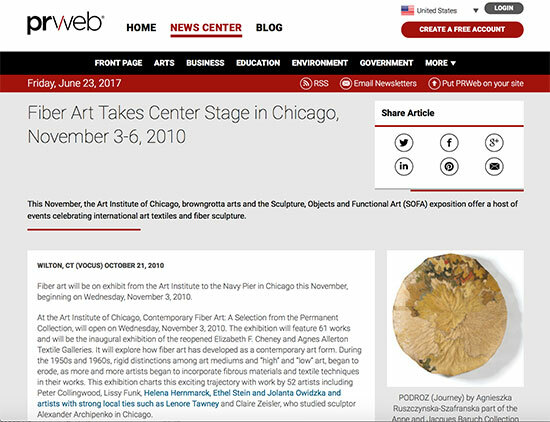 The 24 artists in this exhibit have a close relationship to a traditional, culturally associated craft aesthetic, manifested in a contemporary manner. They have chosen conventionally Asian materials and/or techniques (dyes, papers, gold leaf, persimmon tannin, kategami) used in both time-honored and unconventional ways. 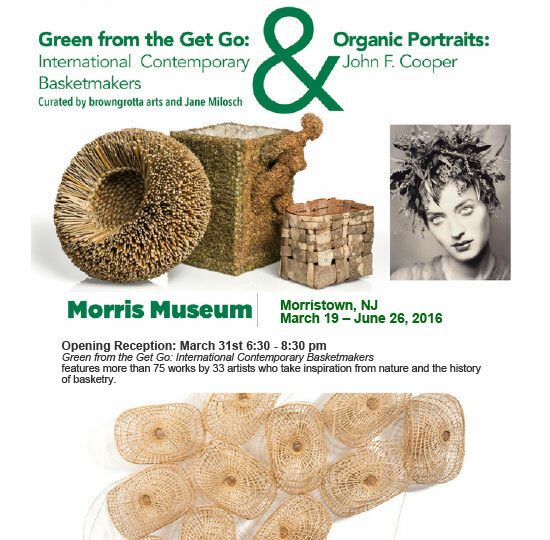 Green From the Get Go: International Contemporary Basketmakers & Organic Portraits: John F. Cooper, Gallery Tour and Talk Wednesday, June 15 at 2 PM Join curator Tom Grotta for an exclusive tour of the Morris Museum’s current exhibition, Green from the Get Go. Including ground-breaking innovators, as well as emerging talents, the exhibition features objects that find inspiration in nature and the history of basketry. 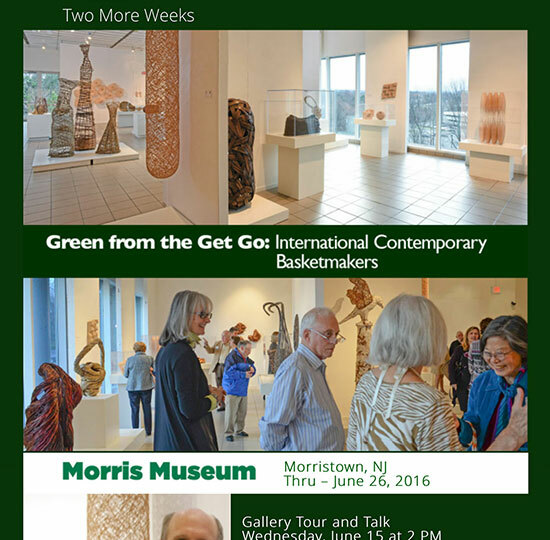 Green from the Get Go will be on view at the Morris Museum through June 26, 2016. 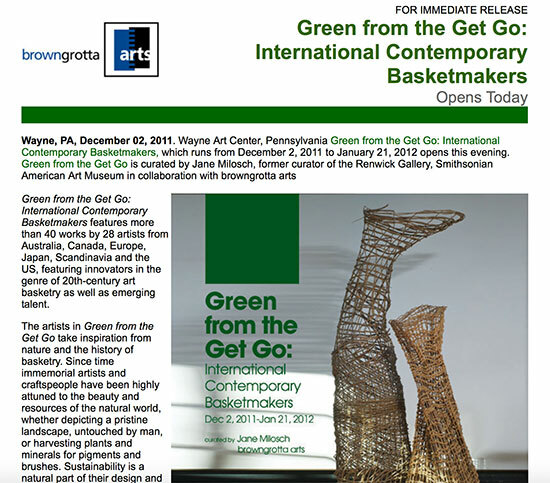 Green From the Get Go: International Contemporary Basketmakers & Organic Portraits: John F. Cooper, Sustainability is part of the design and craft process, which requires a heightened sensitivity to materials, one which honors the caring for, replenishing, and repurposing of materials. Some of these sculptural baskets are made from both flora and fauna, from bamboo, pine, sea grass, and willow to emu feathers and porcupine needles. 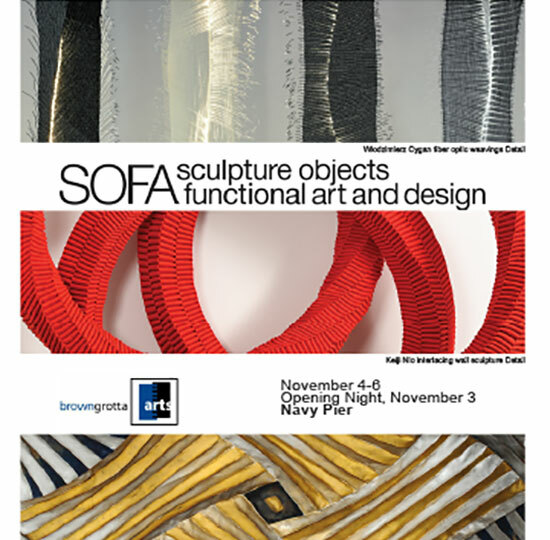 Each maker brings their own conceptual approach and expression to their design and fabrication process. Some works are small enough to nestle in the hand or rest table-top, while others are monumental or hang on the wall. 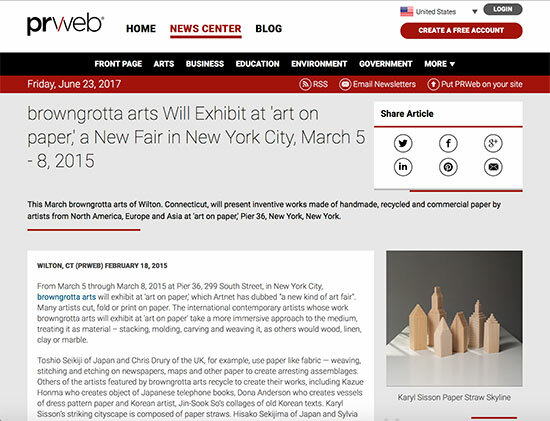 browngrotta arts will Exhibit at Art on Paper, in New York City, March 3 - 6, 2015, This March, browngrotta arts of Wilton, Connecticut will present inventive works made of handmade, recycled and commercial paper by artists from North America, Europe and Asia at art on paper, New York, New York. 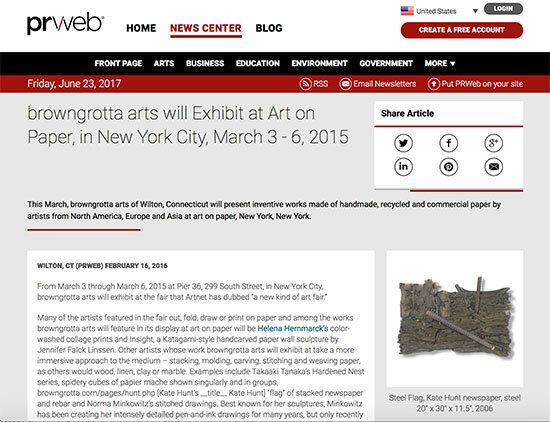 Wilton, CT (PRWEB) February 18, 2015 This March browngrotta arts of Wilton. 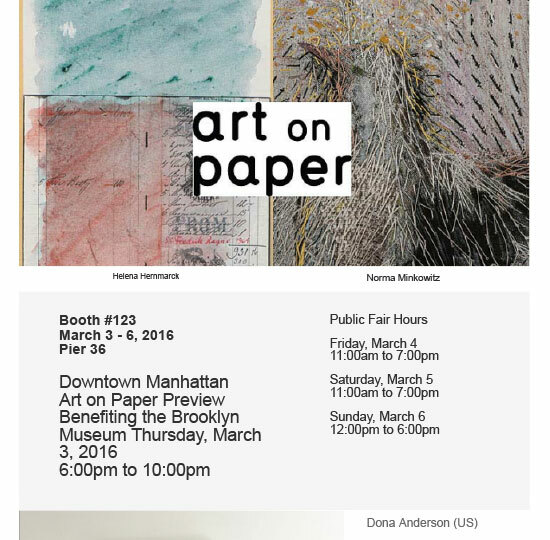 Connecticut, will present inventive works made of handmade, recycled and commercial paper by artists from North America, Europe and Asia at 'art on paper,' Pier 36, New York, New York. 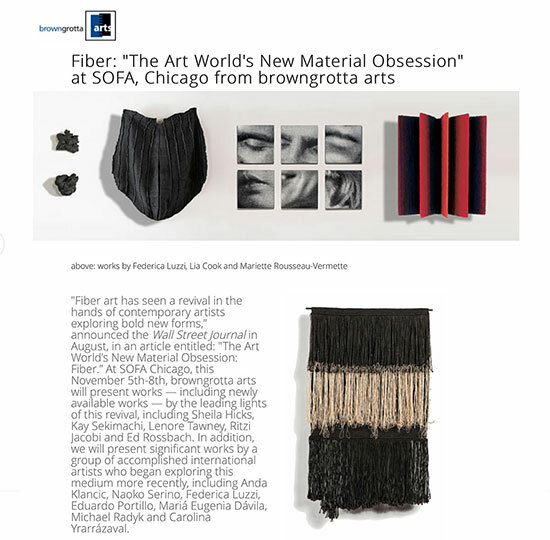 "Fiber art has seen a revival in the hands of contemporary artists exploring bold new forms,” announced the Wall Street Journal in August, in an article entitled: "The Art World’s New Material Obsession: Fiber.” At SOFA Chicago, this November 5th-8th, browngrotta arts will present works — including newly available works — by the leading lights of this revival, including Sheila Hicks, Kay Sekimachi, Lenore Tawney, Ritzi Jacobi and Ed Rossbach. In addition, we will present significant works by a group of accomplished international artists who began exploring this medium more recently, including Anda Klancic, Naoko Serino, Federica Luzzi, Eduardo Portillo, Mariá Eugenia Dávila, Michael Radyk and Carolina Yrarrázaval. 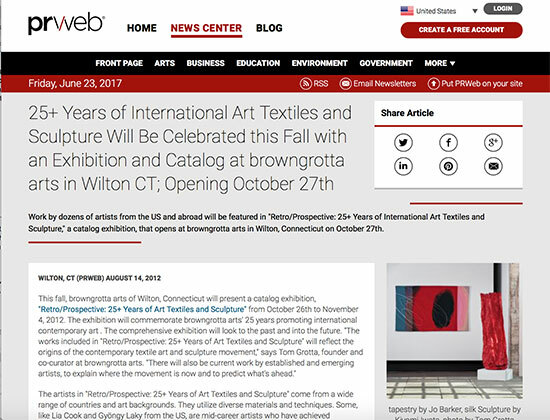 WILTON, Conn., October 2014-- It looks as if 2014 will be the year that contemporary fiber art finally gets the recognition and respect it deserves. 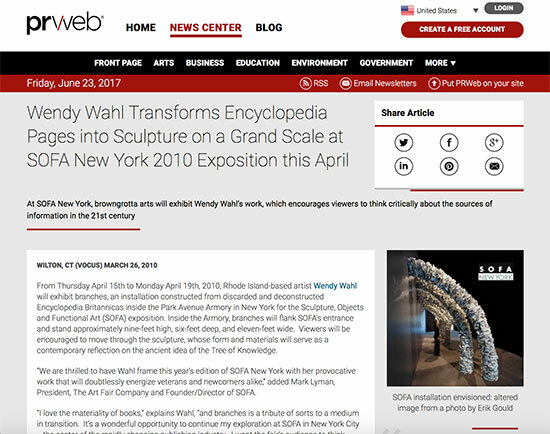 For us, it kicked off at the Whitney Biennial in May which gave pride of place to Sheila Hicks’ massive cascade, Pillar of Inquiry/Supple Column. 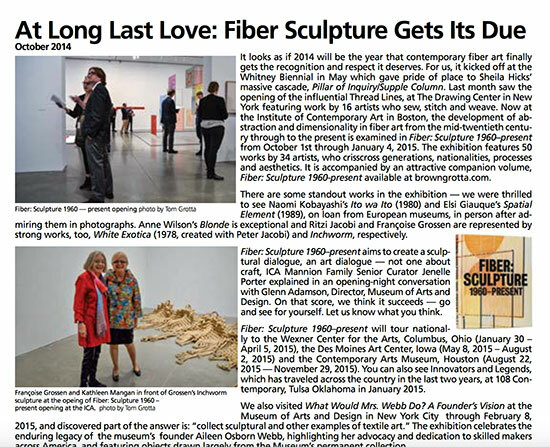 Last month saw the opening of the influential Thread Lines, at The Drawing Center in New York featuring work by 16 artists who sew, stitch and weave. 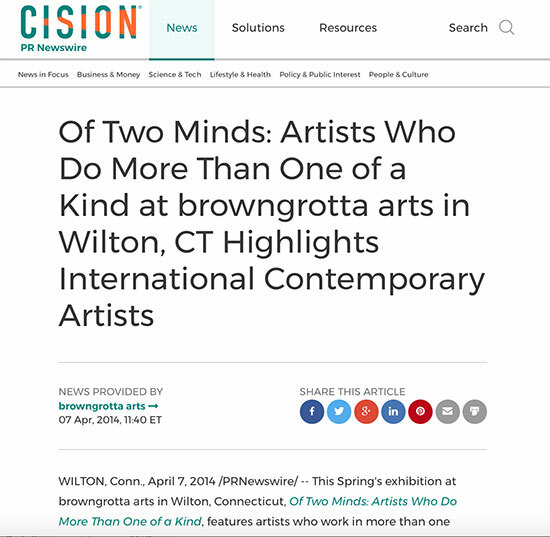 WILTON, Conn., April 7, 2014 /PRNewswire/ -- This Spring's exhibition at browngrotta arts in Wilton, Connecticut, Of Two Minds: Artists Who Do More Than One of a Kind, features artists who work in more than one medium, work with more than one material or more than one technique. 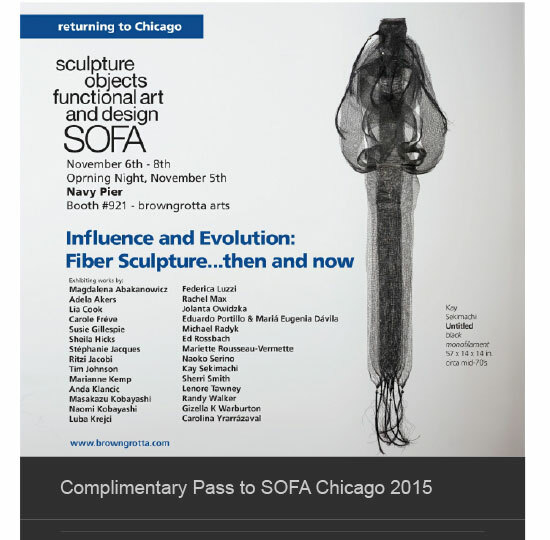 On exhibit will be sculptures, paintings, objects and wall works by 25 international artists. 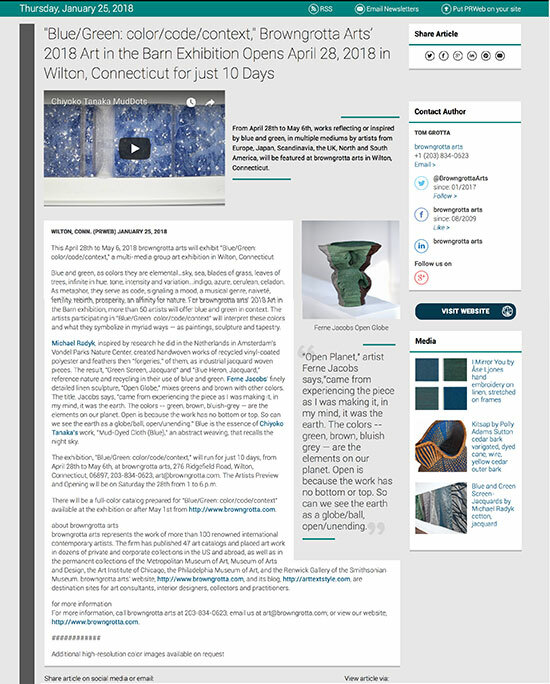 Wilton, CT (PRWEB) November 26, 2012 On Monday, November 26, 2012, browngrotta arts of Wilton, Connecticut will present an online exhibition, "Retro/Prospective: 25+ Years of Art Textiles and Sculpture" at http://www.browngrotta.com. Sales made online or by telephone on CyberMonday will be discounted 10% (excluding tax and shipping). 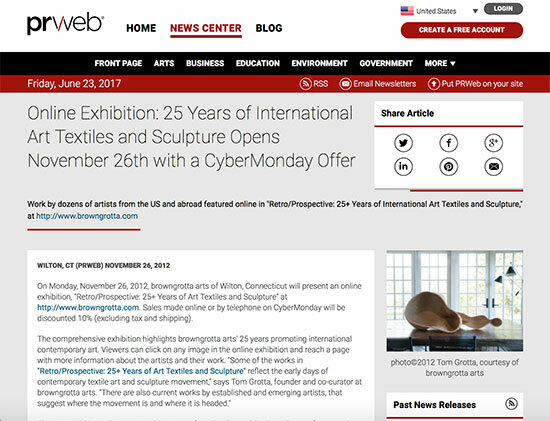 Wilton, CT (PRWEB) August 14, 2012 Work by dozens of artists from the US and abroad will be featured in "Retro/Prospective: 25+ Years of International Art Textiles and Sculpture," a catalog exhibition, that opens at browngrotta arts in Wilton, Connecticut on October 27th. October 27th, 1:00 - 5:00 p.m. 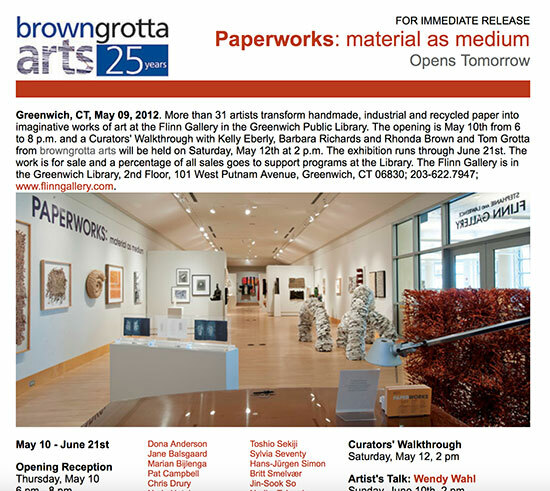 The Flinn Gallery at the Greenwich Public Library, is hosting Paperworks: material as medium, curated by Kelly Eberly and Barbara Richards in collaboration with browngrotta arts of Wilton, CT through June 21st. 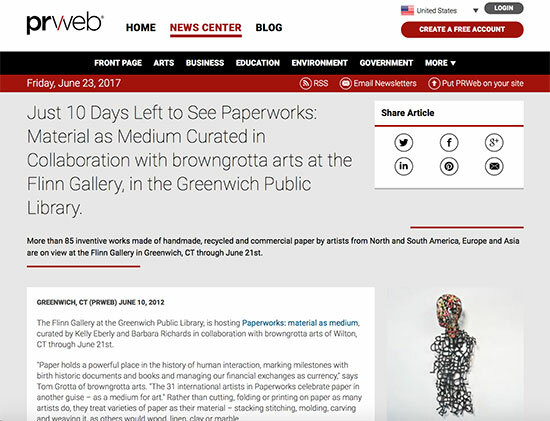 PAPERWORKS: material as medium. Greenwich, CT, May 09, 2012. More than 31 artists transform handmade, industrial and recycled paper into imaginative works of art at the Flinn Gallery in the Greenwich Public Library. 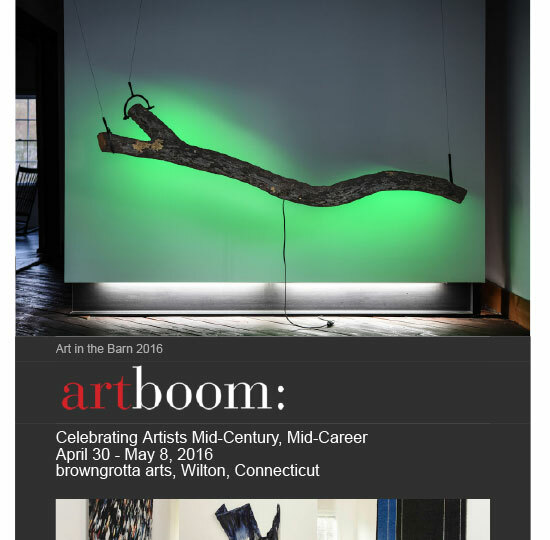 The opening is May 10th from 6 to 8 p.m. and a Curators' Walkthrough with Kelly Eberly, Barbara Richards and Rhonda Brown and Tom Grotta from browngrotta arts will be held on Saturday, May 12th at 2 p.m. 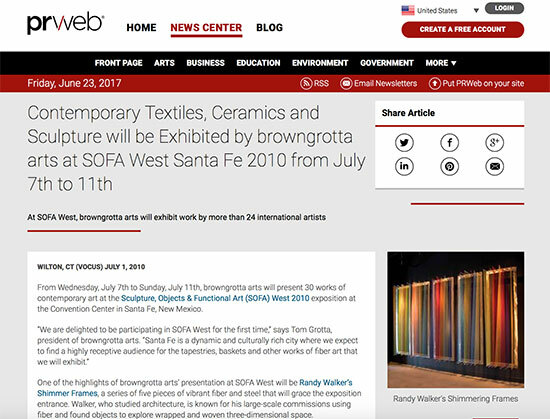 The exhibition runs through June 21st. 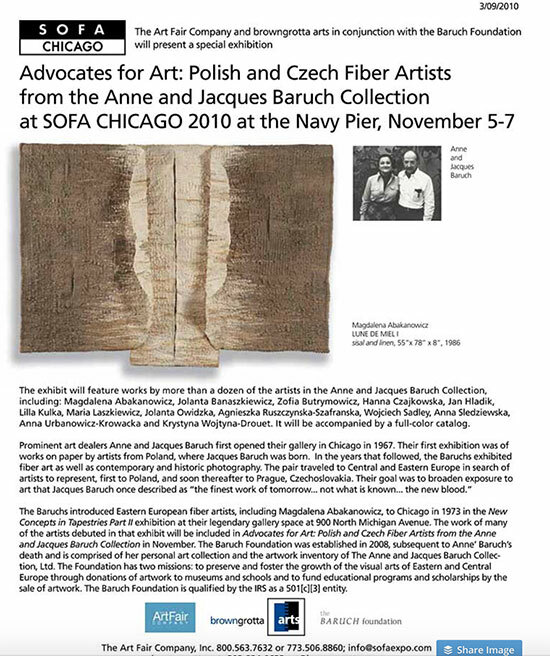 October 21, 2010 -- This November, the Art Institute of Chicago, browngrotta arts and the Sculpture, Objects and Functional Art (SOFA) exposition offer a host of events celebrating international art textiles and fiber sculpture. 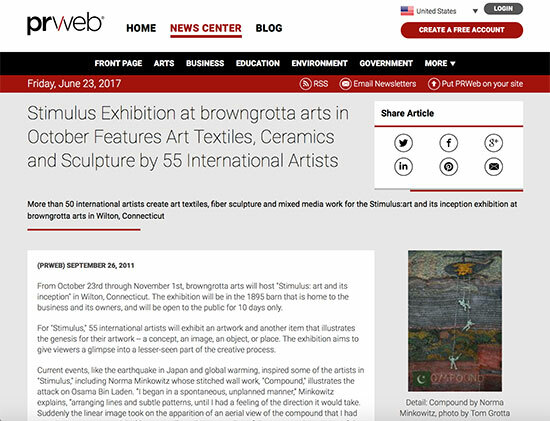 August 30, 2010 -- browngrotta arts’ blog, arttextstyle.wordpress.com, offers a diverse look at art, art textiles and fiber sculpture; its Facebook page provides news on artists and events. Beginning in September, guest blogger, Kim Schuefftan, will write about art in Japan. 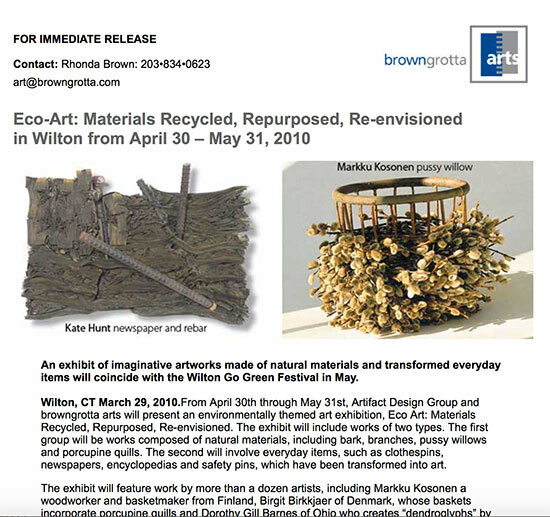 April 27, 2010 -- An exhibition of imaginative and environmentally conscious artworks made of natural materials and transformed everyday items will coincide with the Wilton Go Green Festival on May 2nd. 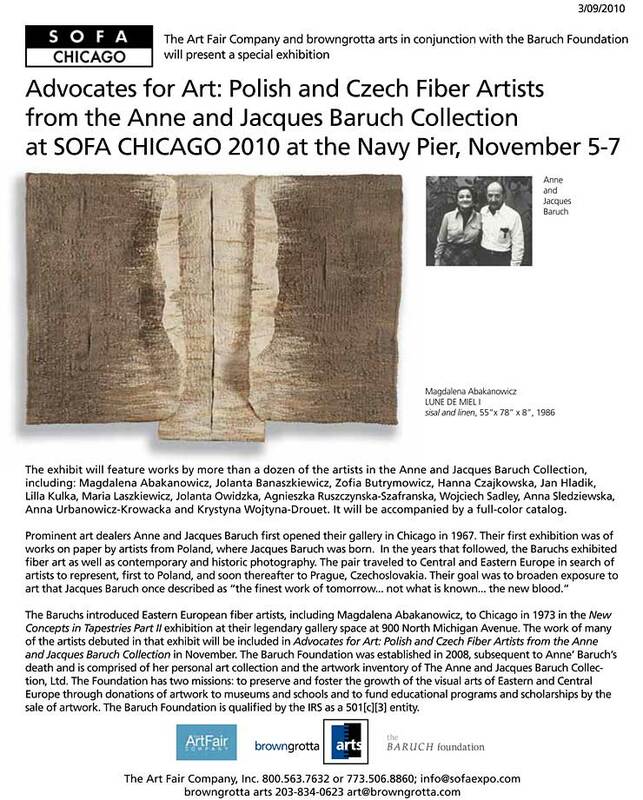 January 29, 2010 -- With the cooperation of the Baruch Foundation and the Lenore G. Tawney Foundation browngrotta arts will feature weavings, collages and mixed media sculptures by textile pioneers Magdalena Abakanowicz and the late Lenore Tawney in its installation at AIFAF 2010. 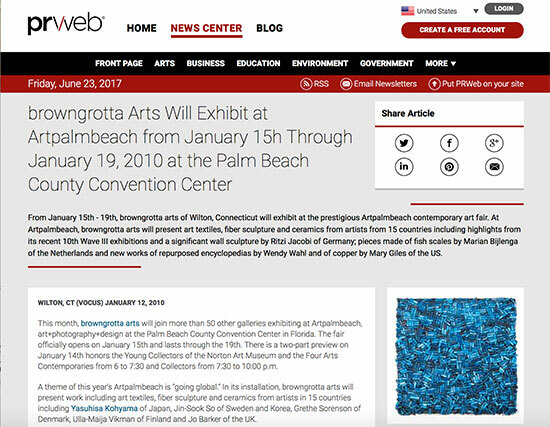 January 12, 2010 -- From January 15th - 19th, browngrotta arts of Wilton, Connecticut will exhibit at the prestigious Artpalmbeach contemporary art fair. 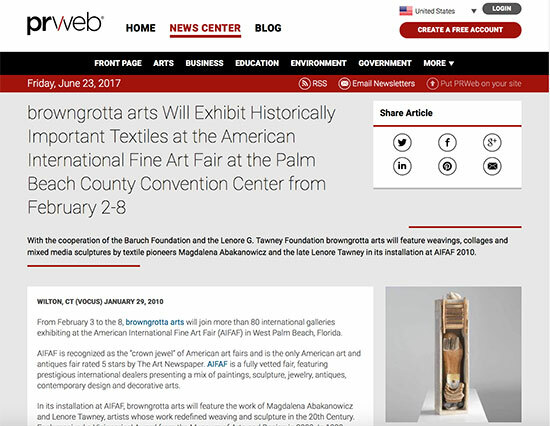 At Artpalmbeach, browngrotta arts will present art textiles, fiber sculpture and ceramics from artists from 15 countries including highlights from its recent 10th Wave III exhibitions and a significant wall sculpture by Ritzi Jacobi of Germany; pieces made of fish scales by Marian Bijlenga of the Netherlands and new works of repurposed encyclopedias by Wendy Wahl and of copper by Mary Giles of the US. 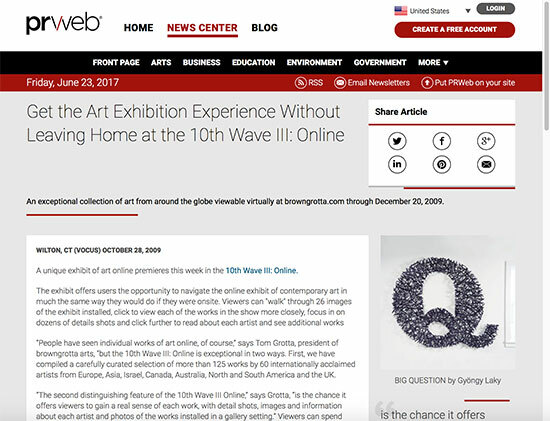 October 28, 2009 -- An exceptional collection of art from around the globe viewable virtually at browngrotta.com through December 20, 2009. 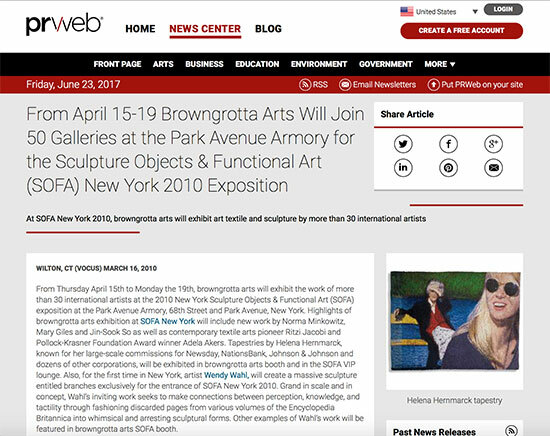 August 28, 2009 -- This Fall browngrotta arts will offer an expansive look at the nation's most intriguing art form in the 10th Wave. 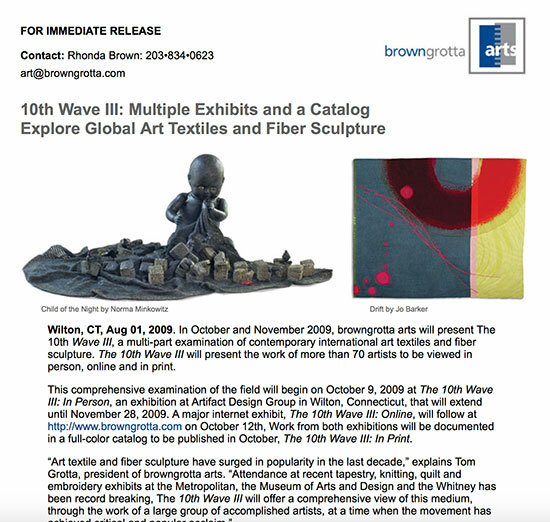 In October and November 2009, browngrotta arts will present The 10th Wave III, a multi-part examination of contemporary international art textiles and fiber sculpture. 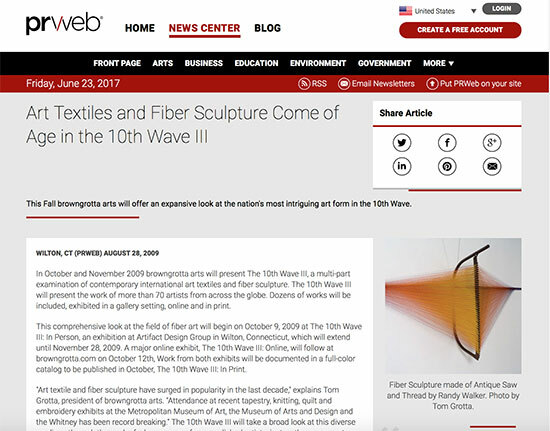 The 10th Wave III will present the work of more than 70 artists to be viewed in person, online and in print.